According to a report released by the US Congress, Donald Trump and his entourage have been trying to transfer nuclear technology to Saudi Arabia since 2017. 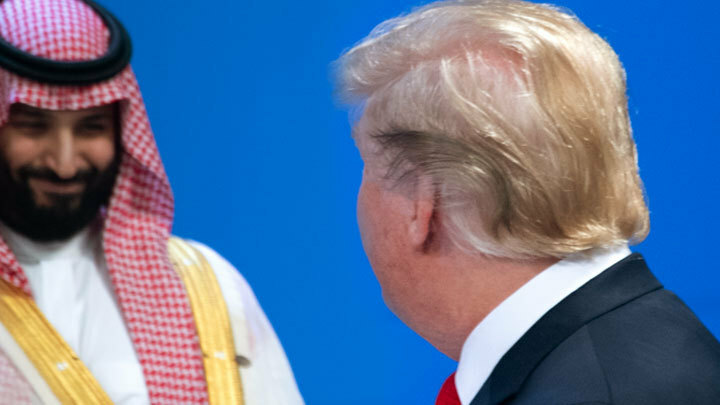 Why does Trump help Mohammed bin Salman in obtaining prohibited weapons and how dangerous is the emergence of another nuclear power in the Middle East? The House of Representatives, in which after the November elections the majority is occupied by democrats, took up the investigation of a very important issue for world security - the transfer of nuclear technologies to the Kingdom of Saudi Arabia (KSA). The latest report of the Committee on Supervision and Government Reform says that Donald Trump, from the first days of his presidency, is seeking to push the sale of nuclear power plants for KSA by American firms. The former Trump administration’s former national security adviser, Michael Flynn, and son-in-law, Jared Kushner, acted as mediators for the deal. Flynn was a consultant to a subsidiary of IP3 International, which was the author of the construction of nuclear power plants in Saudi Arabia. IP3 presented the deal as a “Marshall Plan” for the Middle East. According to the authors, not only Saudi Arabia, but also the USA, benefited from the deal. This was supposed to create additional jobs, boost the US atomic industry, and strengthen Washington’s ties in the Persian Gulf. The argument in favor of business was that, if the Americans refused, Russian and Chinese competitors would take their place. When investigations began in 2017 against Flynn, Trump replaced him with Herbert McMaster. And the latter slowed down the initiative to transfer nuclear technology. However, until today, negotiations with the Saudis have not ceased and were conducted under the patronage of Energy Minister Rick Perry. Last week Trump invited 12 companies to the Oval Office to discuss construction of a nuclear power plant in Arabia. The meeting was attended by Perry, members of the National Security Council and the State Department. There were also representatives of CBS Corporation (formerly Westinghouse Electric). The latter is owned by a company that has a stake in the Kushner family’s Manhattan skyscraper. Kouchner himself next week will go to Saudi Arabia, where he will certainly raise the issue of nuclear technology. Apparently, on the eve of Kouchner's visit, the House of Representatives announced its intention to investigate the deal with Saudi Arabia. The committee demands that before March 5 the White House should provide all the details of the construction of the nuclear power plant. How dangerous is the transfer of nuclear technology in Saudi Arabia? Technology transfer to Riyadh is a very dangerous undertaking, congressmen say. Federal law does not prescribe the conditions on which the transfer of these technologies should be negotiated. So purely legally, the White House's hands are untied. Therefore, the fate of the issue depends solely on the determination of Congress. The legislature may insist on the inclusion in the text of the treaty a “golden rule” prohibiting the KSA authorities to use technology to create nuclear weapons: 1) uranium enrichment and 2) processing of spent nuclear fuel. It is the “golden rule” that the Saudi crown prince Mohammed bin Salman refuses. Thus, he dispelled all the illusions of Congress about whether he was going to acquire a forbidden weapon or not. Moreover, Bin Salman once already spoke of intentions to get a nuclear bomb. Will Trump go to a “nuclear deal” with Ben Salman? The possible acquisition of nuclear technology by the Saudis will lead to serious problems for global security. First, we get another unstable nuclear weapon regime. Secondly, the radical Islamic regime possessing nuclear weapons. Thirdly, it is a huge incentive for nuclear development in other Gulf countries, primarily in Iran, for which Saudi Arabia is the main adversary. Iranians can rightly think - since the Saudis can be engaged in nuclear development, why can't Iran do this? Bin Salman’s support is justified primarily by helping the crown prince to help Trump deal with the Israeli-Palestinian issue. If Congress blocks the nuclear deal, then Trump has an alternative. Nuclear technology can be transferred to the Saudis by Pakistan, which itself possesses nuclear weapons. But will Trump decide to ensure that the Pakistani special services give the Saudis a "bomb"? Inside Saudi Arabia, the struggle for power continues. This country is quite heterogeneous in terms of resettlement and confessional composition. Saudi largest deposits are located in the east, where the Ismailis and representatives of other Shiite Islamic movements hostile to Riyadh live. Why give Riyadh nuclear weapons when today the Saudi kingdom is at war with Yemen? And if tomorrow or the day after tomorrow the war in Yemen spreads to the territory of Saudi Arabia, where there are nuclear weapons ... What prevents then the terrorists of Al-Qaeda, Dzhebhat al-Nusrah, which the Saudi ruling family has financed for decades, just take and arrange nuclear attacks on territory of the kingdom? Speaking about the Saudis getting a nuclear bomb, one must take into account the regional context as a whole. The Iranian-Saudi confrontation continues. In January 2016, due to the execution of Shiite preacher Nimr al-Nimr in KSA, Riyadh and Tehran almost went to war. The two countries are fighting through their proxies for influence in Lebanon, Yemen, Syria, Qatar and Bahrain. No one can guarantee that, having received a nuclear bomb, bin Salman will not drop it on Iran. Or the fact that KSA will not transfer these technologies to its allies - say, Egypt or the United Arab Emirates. The factor of Israel is also important. At this stage, Riyadh is an ally of the Israeli state, but if the Muslim Brotherhood comes to power in the Sunni kingdom, as it did in neighboring Egypt, Tel Aviv will curse the day when Trump allowed American companies to build nuclear power plants in Arabia.